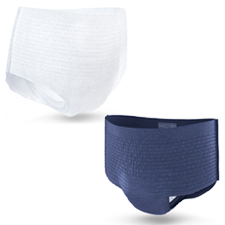 Disposable Pull Up Pants are an affordable and discreet way to manage incontinence. They are breathable, with a waterproof back sheet that encourages the flow of air, maximising skin integrity. They also all feature a super absorbent polymer, which makes them highly absorbent and neutralises odours. Various levels of absorbency are available to meet all needs.